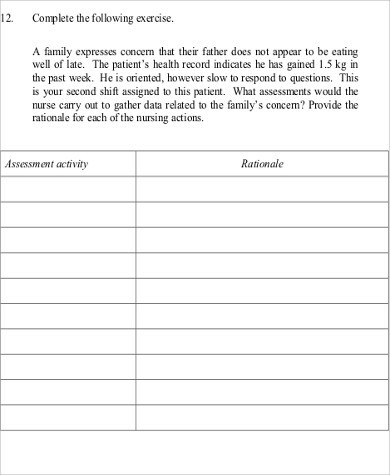 A nursing assessment is the collection of data pertaining to a patient’s physiological, psychological, sociological, and spiritual status. Nursing assessments are conducted by licensed and registered nurses and is the first step in the nursing process. 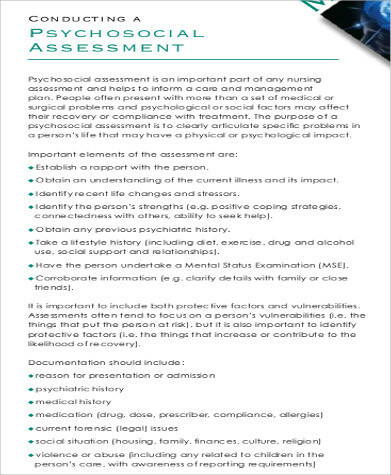 A nursing assessment is used to identify a patient’s current and future needs and is very broad in scope. 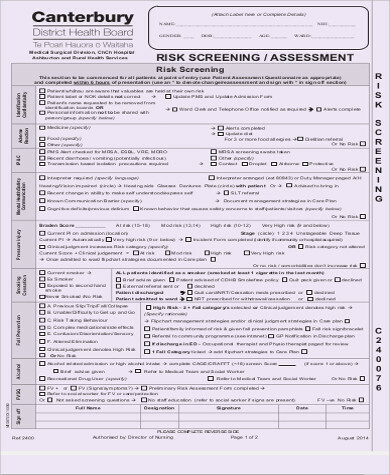 A nursing assessment goes through certain set procedures in order for a nurse to properly evaluate an individual. 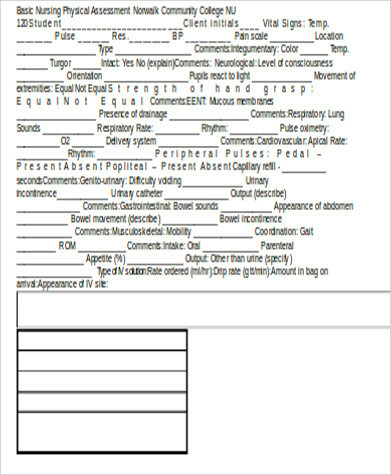 Assessment forms are typically utilized by a nurse when conducting these evaluations. You can view our Sample Assessments or download them to help you save on time and money. The initial part of a nursing assessment is the client interview. A professional and therapeutic mode of communication has to be established when talking to a patient, and questions using the OLDCART acronym can be used. 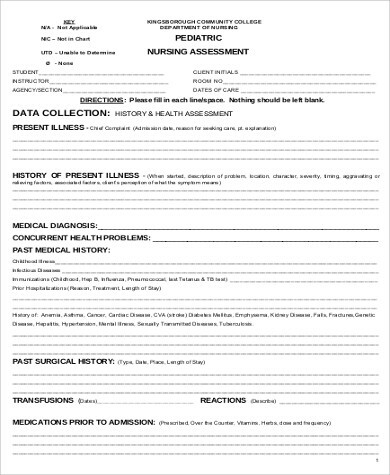 A collection of the patient’s history is also gathered during the interview such as the patient’s medical history, health history, social history, family history, previous and current doctors, medicine taken, etc. A physical examination includes the taking of vital signs such as temperature, pulse, blood pressure, and respiratory rate. Physical examination techniques are also used such as palpation, auscultation, and percussion. In addition, an assessment of the patient’s integument such as the color, texture, turgor, and elasticity of the hair, nails, or lesions as well an examination of the head, the ears, and the eyes are included in the physical examination. 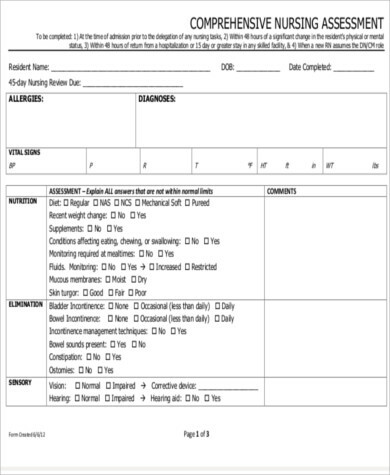 Physical Assessment Forms and Fitness Assessment Forms may also be used to document the results of a physical exam. 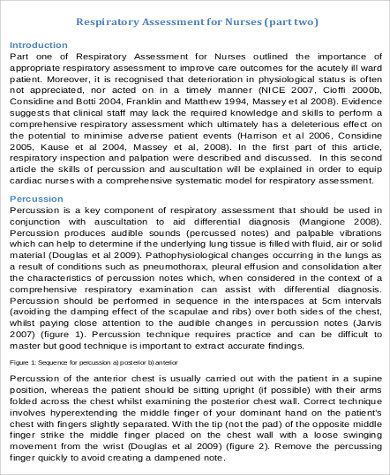 An assessment of the patient’s sensory and muscular function of the arms, legs, as well as peripheral circulation is done during a nursing assessment. In addition, pulses, capillary refill, temperature, sensation, and skin color are also objectively observed. A patient’s mood, grooming, memory, gait, posture, orientation, response to verbal stimuli, cognitive function, signs of hallucinations or delusions, and speech patterns are some aspects to consider when assessing an individual’s mental health. A patient’s cultural assessment, on the other hand, can be based on varying factors. Some examples are the patient’s ethnicity, his primary and secondary language, religious belief, and practices, etc. The findings of these assessments can be properly organized and documented using Self-Assessment Forms or Psychosocial Assessment Forms. Our assessment forms offer easy access to help save you time and money—indeed, they are for free. They are also available in PDF format, which is compatible to most devices and is lightweight in terms of file size. Download now!